San Ramon, California (USA) Pinball Champ is the successor to Pinball Champ ‘82 and was made in 1983. Differences are mostly in the colors on the playfield and backglass. This particular game was played nearly non-stop at "Pin-A-Go-Go 2002" with no problems! Beautiful Varathaned playfield. 124829 7 unknown USA fully working Unlike other Pinball Champs from 82 and 83, this one has five 7 digit displays. It also has 7 digit Italian score cards and the Italian speech roms and LIRE coin mechs, so its from the lot of 7 digit games that were supposedly made in 83.
www.tilt.it Bologna (Italy) In storage, project game. 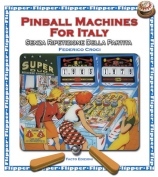 Another ‘Pinball Champ 83′ featuring five 7 digit displays. Supposedly, a short production run of about 100 machines were built with 7 digit displays (and different playefield) during the making of "Farfalla".